14 walls, 3 coloured glass walls, 10 Vitrines in powder-coated stainless steel and glass, 5 pedestals, 29 m. long wall painting in 58 shades of grey - a graduation from white to black, 60 m. tactile floor system for the blind, 5 m. diameter orange- red floor sticker. 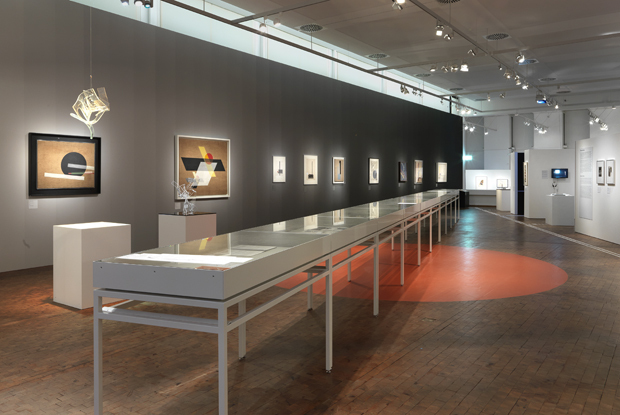 The design for this extensive exhibition featuring the work of László Moholy-Nagy integrates over 300 works across a wide range of media. Inspired by the expansive open space of the original Bauhaus Archiv interior, we removed the existing temporary walls that overwhelmed the space, instead using a minimum of temporary walls to form intimate enclosures set within large open areas. Coloured glass was used to maintain the views throughout the main space and to create zones in which to experience specific thematic sections while referencing the overlapping planes in Moholy-Nagy’s work. 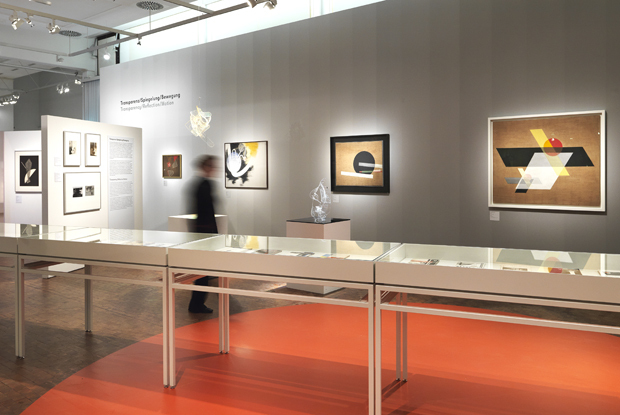 The influential artist’s immersive and sensory ideas and his aesthetic themes were further referenced in the strategy of the exhibition layout, realized in the specific context of the Bauhaus Archiv. The feature wall of the exhibition hall was painted in a series of gray-scale stripes that move from white to black through 58 gray tones, referencing the dark / light qualities of projection and providing a fresh context for major paintings, while emphasizing the large open space and tying the exhibition spaces together. Since books and documents were very important for the curator’s concept, we highlighted these materials in a series of custom designed display cases placed at a dynamic angle in the main exhibition hall. 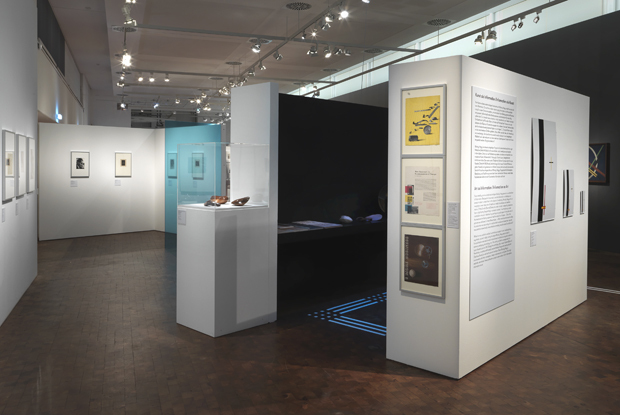 The exhibition design presents these text-based items as an important aesthetic and conceptual element within the overall layout of artworks, making it one of the first impressions of the exhibition. Further elements included floor graphics that were integrated with a system for the blind as well as a touch chamber that featured tactile work.